A settlement has finally been reached with all parties concerned in the Orono Flyby incident. 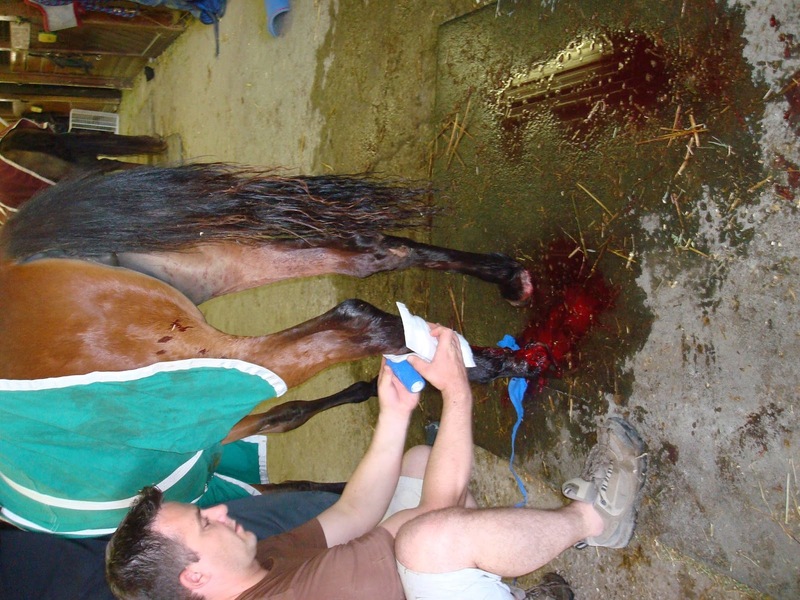 It is a small morale victory for our mare that was severely injured during the Canada Day celebrations six years ago. One horse had to be destroyed while several other horses were treated for minor wounds and injuries at our farm. The incident attracted wide media attention at the time and more than a thousand hand signatures were collected from the public supporting an initiative to ban such aerobatic displays over lands where livestock are involved. Support for this petition to become a private member's bill stretched across the country and a Member of Parliament from B.C. was willing to take a look at our case just prior to the federal election at that time. I would especially like to thank my legal team who took on the “David and Goliath” case as I fought with passion to see that this never happens to anyone else. As horrible as this story is, it is not an isolated incident. There have been others in the past that have quietly gone away and kept from the public eye. The Tragedy WARNING... GRAPHIC PICTURES FOLLOW THE END OF THIS STORY. It was the Canada Day weekend holiday and the village’s 175 year celebration. The week leading up to the celebrations, we put in 3,000 bales of hay. All of our surrounding farm neighbours were doing the same thing. We are a working farm, operating 7 days a week, 365 days a year and at this time of year, there is no leisure time. 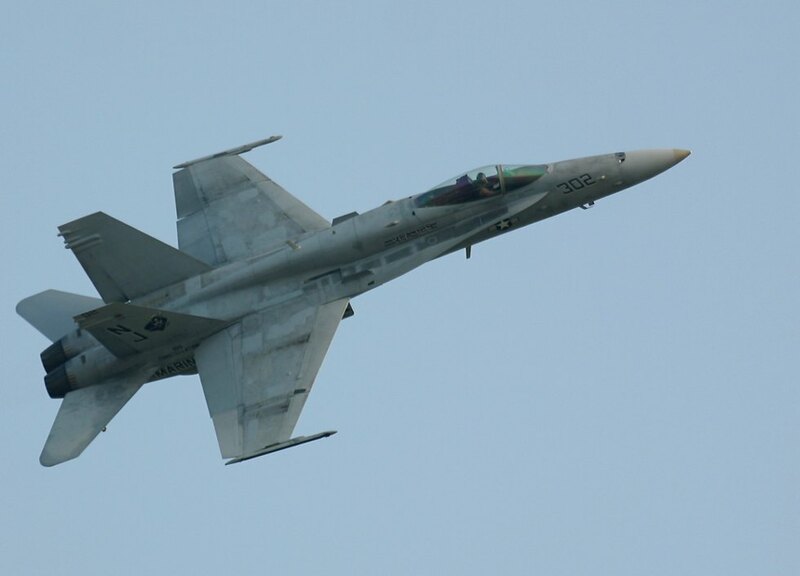 Part of the many celebration activities planned that weekend was a flyby by the Military’s F18 fighter jet. Little did we know that our farm was in the direct flight path of the jet dropping to its lowest elevation of just 500 feet above our pasture and facilities on its way to it target audience just one-half a kilometer away. Celebration organizers had failed to notify us or hold consultation with us when planning this event, concerning this high risk activity about to bear down on our horse farm with such horrendous results. We had received no direct notification as to the date or time when this part of the celebration activity was to be held, or the fact that we were in the flight path which had been altered to avoid the private zoo to the east of us. It was an oversight that would prove to have catastrophic consequences for everyone involved with the farm. In hind sight if we had been involved in the planning process we would most likely have expressed our concerns for our horses' welfare and safety. The only way we could have protected them would have been to remove the entire herd from the farm property are relocate them elsewhere during the air show. On the day of June 30, 2007, our daily farm chore and lesson program was conducted as usual. Horses were turned out so chores could be done; lessons progressed in the arena as scheduled. Fortunately, I had just finished my last lesson of the day when the jet arrived, swooping down with great speed just above the tree-line and directly over our west pasture before passing over the main arena roof then climbing steeply as it circled back over our farm in all completing five passes. I managed to get the student off her horse safely and put the horse in a stall still with its tack on. 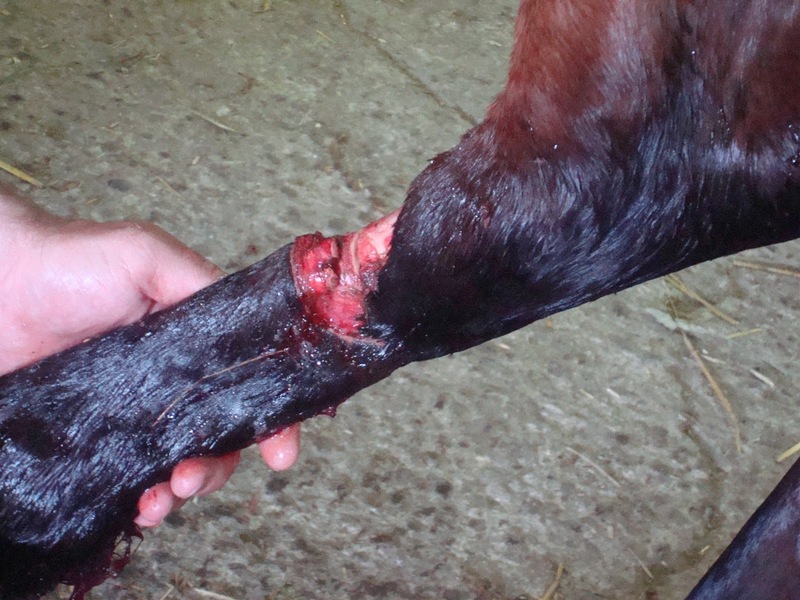 A client was ground driving her Morgan mare at the time and managed to control her without injury. Those few remaining horses that were in the stable at the time of the flyby were frantic in their stalls, some receiving minor cuts and bruises. The remaining 30 horses on our farm were out on pasture in different turnouts; one to the north, another to the south and east. Understanding the psyche of horses, and other animals for that matter, is extremely important when planning such events where noise and form appear to be predators to these animals. In their mind, they were under attack by the fighter plane. Their whole instinctive survival mechanism is flight. 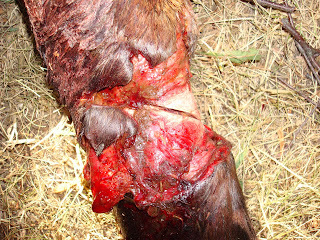 It appears that the yearling filly who suffered the mortal injury was trying to clear the fence and got entangled in it. With each pass of the jet, her panic was heightened as she struggled to free herself time and time again, cutting her hind leg so severely that it sliced through two tendons, cutting into the cannon bone and entering the marrow. 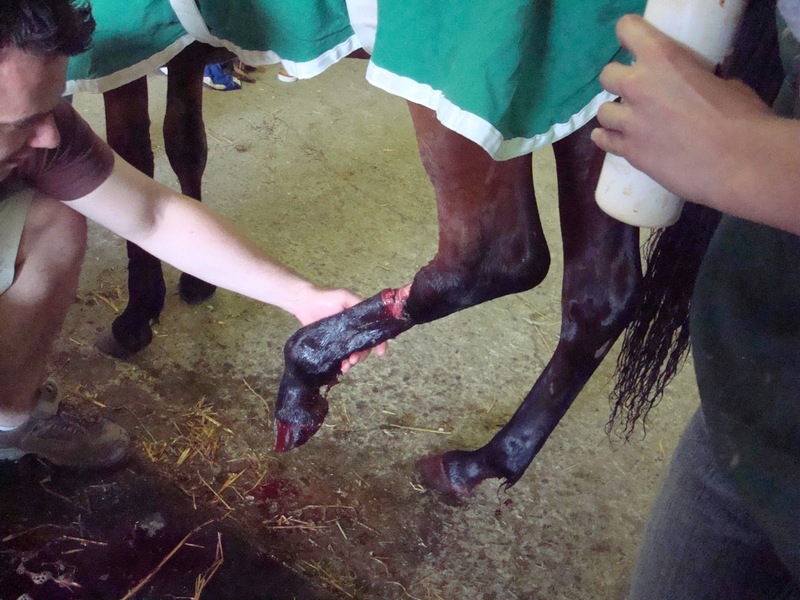 This devastating injury rendered her hind limb useless. She was later humanely destroyed. The older mare caught her left front hoof in the page wire and in her own terrorized state. 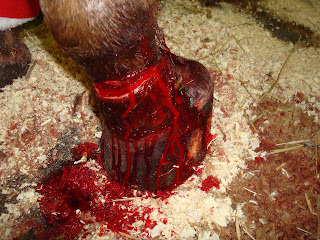 The injury cut to the bone severing an artery. She remained in critical condition. Several other horses had less grievous injuries that could be treated without major intervention, including those in their stalls at the time. A dozen people came to our aid. Four men struggled to support the yearling filly as she awkwardly made her way into the stable. The older mare walked slowly under her own steam to the stable. 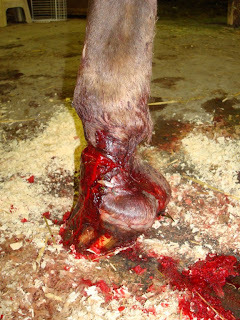 The veterinarian was summoned immediately as we applied first aid treatment to the horses awaiting her arrival. I personally took over monitoring vitals signs and organized a temporary sling to help support the injured horses that had lost life-threatening amounts of blood at this point. Pressure bandages were applied time and time again to help control the bleeding. 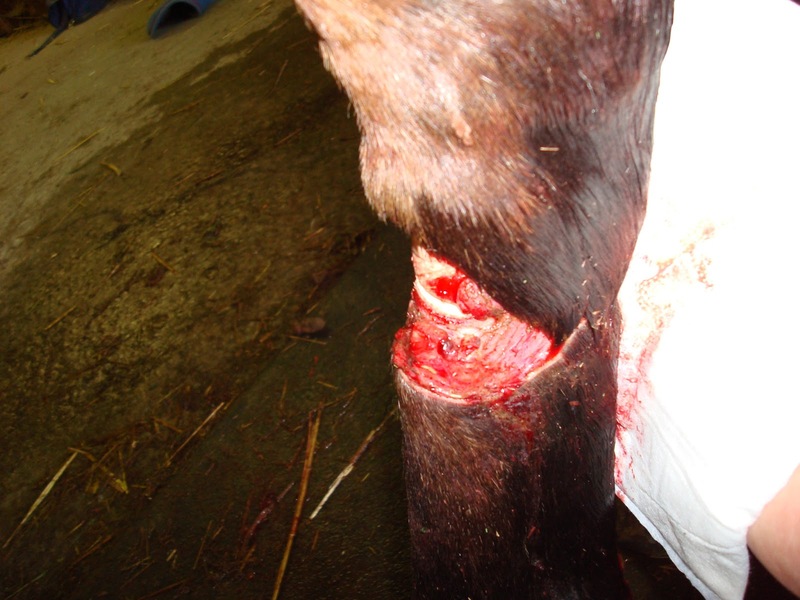 When the bleeding was somewhat controlled, we irrigated the wounds and dressed them until the veterinarian arrived. With the horses succumbing to shock and the injuries so severe, we called in a second veterinarian to assist. Drs. Cox and Morrison worked feverously on the two most seriously injured animals. In the end, the filly was euthanized. Her owner was so distraught and unable to assist the veterinarian with this task, so I took over this very sad duty. We were able to document both the injuries and position of the jet. A client, who was videotaping his daughter at the time of her lesson which had just completed, turned his camera to the sky and caught the jet on film flying over the pasture and arena with a terrifying super-sonic noise left in its wake, shaking the arena walls. Another client had a friend with her who is a professional photographer. She took the graphic pictures of the injuries before treatment. The pasture and stable area looked like a war zone. Huge pools of blood stained and smeared the field grasses and concrete aisle ways of the stable, littered with red stained towels and discarded packaging from sterile bandages and the like. Our well-stocked emergency vetting station was depleted of many items that afternoon. Fortunately, this was just after we had done a complete inventory and had replenished stock just days before this incident. It was a horrific day for us at the farm that had left us all numb with disbelief. We may have survived the first pass of the jet that would have startled the horses, but impossible to maintain calm with so many passes over and over. I harbour no ill feelings towards our Canadian Military. In fact I have a nephew who proudly served his country in Afghanistan. I understand this was not intentional, although a misguided adventure resulting in tragedy. We have been a resident of Orono for the past 34 years and contribute our time and resources to many of the Village’s projects. Unfortunately, for us, this celebration was not a pleasant one. 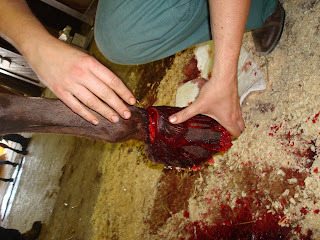 Below are some very graphic pictures of the injuries sustained by the horses. I decided to include these to bring a sense of realism to this story and all its horror that day. The video of the of the jet passing over the pasture and arena will be posted on You Tube but restricted to private viewing. Permission to view this video must be requested.